The microwave gets dirty quickly with food spills. It has to be cleaned frequently otherwise it will turn into a real germ and bacteria community. The regular cleaning products contain many chemical compounds, very harmful for your health and for microwave’s compounds. But, you can use baking soda to clean your microwave because it very gently with your skin and with your microwave. Besides, it cleans and disinfects effectively. All you have to do is to dissolve 3-4 tablespoons of baking soda in a bowl of water and add it to the microwave. Start the oven at maximum power for 3-4 minutes. The water will turn into vapors, and it will deposit on the microwave walls, soaking the dirt. 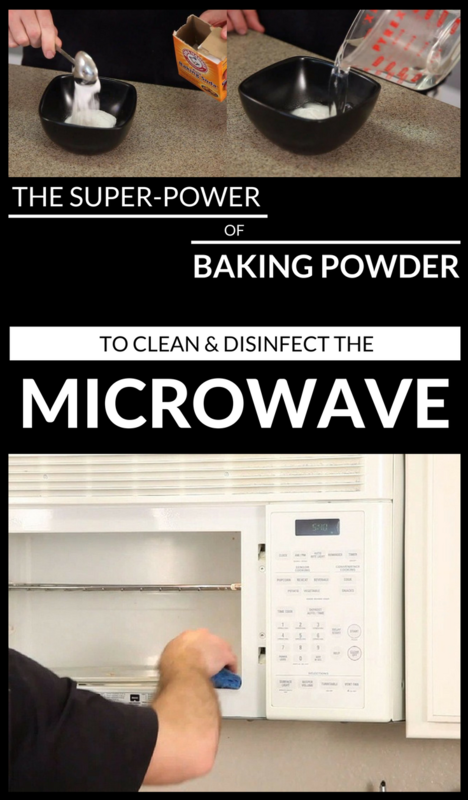 All you have to do next is to clean the microwave dirt with a clean cloth.